With the warmth of highland wool, but with a geometric pattern reminiscent of skyscrapers back in New York. Worked from the top down. $7. Purchase here. Inspired by the structured and fitted cardigans of the 1940’s. Complete with elbow-length bell-sleeves, a peplum with garter stitch detail, garter saddle shoulders and a scooped neckline. $7. Purchase here. Simple and a bit off-kilter. An assymetrical scarf worked tip-to-tip with a picot edging. $4. Purchase here. A wide cowl to cover décolletage. 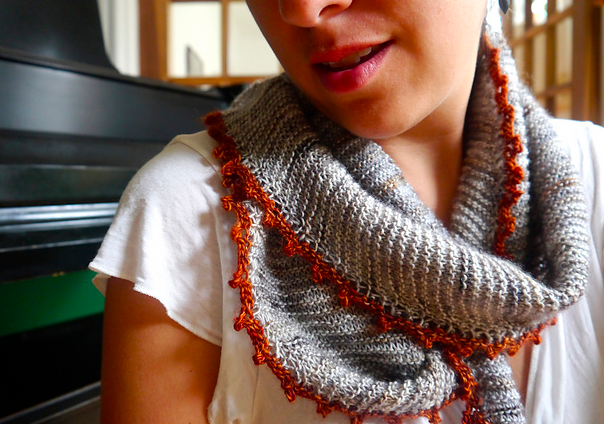 Worked in a trio of stitch patterns; ribbed, double moss and garter diamonds, the cowl is fully reversible and available in single- or double-wrapped lengths. $4. Purchase here. Loops and cables and bobbles like twists through time. $4. Purchase here. A winding cable cuts down the center back of this swingy, oversized raglan cardigan. It is lightweight but warm, worked in reverse stockinette with stockinette borders. $7. Purchase here. For the healing properties of flowers. Worked from the bottom-up with a two-color brim, colorwork and a slight slouch. $5. Purchase here.